The amount of freight on the Seddonville line declined in the mid-20th century, but in the 1960s there was still a daily train to the Mōkihinui mine. 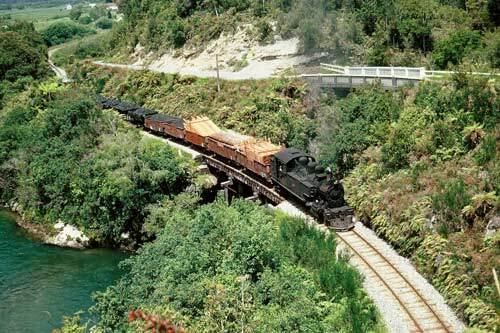 One of the last steam locomotives to work in the region, this Ww 571 is pulling a mixed load of coal and timber across Chasm Creek in the Mōkihinui gorge. The track was closed in 1981, and this section is now part of the Chasm Creek walkway.